"That's what you say to people after death, 'Goodness, that's awkward?'" The DVD Review and Extras Review are by Jeff Wilson. The Third Man is one of those classic films in which everything simply came out right. That it's such a well-loved film, considering the dark nature of the story and the emotions at its heart, attests to the quality on display. Criterion first took a crack at the film on DVD back in their initial batch of releases on the format, and the disc was a perfectly solid representation of the film with some good extras. 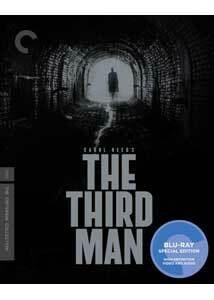 In the DVD age however, nothing is forever, and Criterion has gotten around to refurbishing many of their early releases, leaving us the beneficiaries, for this new edition of The Third Man looks better and is crammed with bonus material befitting its status as an iconic film. The story revolves around Holly Martins (Joseph Cotten), an American author of cheap western novels, and his arrival in post-war Vienna to look up his old friend Harry Lime (Orson Welles ). Holly is shocked to discover that Harry is recently dead, killed after being struck by a car. Left without much of a reason to stay, Holly decides to investigate what seem like loose ends in the story of Harry's death, and uncovers far more than he intended. The Third Man has many strengths, but let's begin by mentioning the cast, which is uniformly strong. Cotten and Welles form the central pairing of the picture, and complement each other well, as they did in so many Mercury Theater projects. Cotten plays the na�ve dupe to Welles' worldly crook, and watching Holly and Lime, you can understand both characters as you see their past friendship (un)easily resume. The actors had already played a similar pairing once before, in 1942's Journey Into Fear, which also saw Cotten as the na�ve American abroad. As the love interest, Alida Valli brings an air of mystery to the role that suits the story and the setting, and Trevor Howard plays Major Calloway with a flinty edge that makes it all the more enjoyable when his moments of heart peek through the hardened exterior. I remain amazed at the subsequent popularity of Harry Lime, such that the character was spun off into radio and television series. Much of this must be due to Welles' charismatic, amusing performance, as audiences obviously forget how heinous Harry is. Or at least I hope they do, given the horror Lime's penicillin racket wreaks on children like the ones Calloway shows to Holly. Lime's willingness to sacrifice anyone who might get in his way is almost a positive trait compared to that. Of course, Lime was heavily sanitized in his later incarnations, becoming a lovable rogue rather than this soulless racketeer. The Third Man is a film that can be enjoyed again and again, and this new edition provides plenty of reasons to keep going back for more. I am forever hesitant to label films as perfect, but this is one that comes really close. As I said at the start, it's a film in which everything comes together to make a magnificent entertainment�one that shouldn't be missed. The disc retains number 64 in The Criterion Collection, continuing the pattern of the same series number being used for successive upgrades. Image Transfer Review: The original full-frame video transfer, compressed using AVC, is rather disappointing. For a picture that is so dependent on light and shadow, the black levels are quite weak and unimpressive. There is some pretty severe edge enhancement visible at times, most notably on the titles and the BBFC certificate, and there are some large compression haloes visible around Valli's head at times. The vertical lines appear to be the worst affected. There is some wear and scratches visible. On the positive side, textures are excellent, and the closeups often have startling amounts of detail. The rather heavy grain structure is transferred decently well (with some artificial grain reduction), though there is a certain amount of sparkle. Audio Transfer Review: The film sports a mono PCM track, which is plagued by the substantial hiss and noise that seems endemic to British pictures of the 1930s and '40s. Dialogue is generally clear, though a few dubbed segments seem of very different timbre. The tonal subtleties of Anton Karas' famous zither score come across with spectacular presence; these most likely would have been lost if there had been more hiss reduction applied, so it's a decent tradeoff. Extras Review: Here's where the major value is if you're an owner of the original edition. Criterion has added a huge amount of bonus material in addition to their usual booklet. For the most part it's good stuff, carrying over materials from their previous release, in addition to several new items. Foremost among these new items, at least in terms of length, is the 2005 feature documentary Shadowing The Third Man (01h:33m:10s). Director Frederick Baker covers the film from conception to its eventual success, including interviews with a handful of the surviving crew, although Alida Valli, the only surviving main cast member at the time, sadly either couldn't be persuaded to participate or was not healthy enough to do so. It's an entertaining enough documentary, but too much time is wasted with clips from the feature that slow down the narrative drive of the documentary. Also present are the following: Graham Greene: The Hunted Man (56m:23s) is a BBC production from the 1960s that weaves clips of Greene adaptations into an interview with the author. Who Was the Third Man? (29m:15s) is an Austrian documentary about the film that has some good stuff in it without encroaching on the longer making-of. There's more that is gathered into different catagories, including two radio shows, one a Lux adaptation of the film itself, the other an episode of the Welles-starring Harry Lime series. The Lux is so-so, but the Welles show is worth hearing if only to see how Lime was lightened up to make him more roguish and less blatantly evil. Moving on, we get to see Anton Karas play the zither (02m:56s); a brief documentary on Vienna's "sewer cops" as seen in the film (01m:49s); and a slide show on Vienna after the second world war. Finally, the film-related background materials include Insider Information (08m:48s), which is narrated production history material set to photos; a comparison of the US and UK opening sequences; and a segment that translates the German dialogue in a couple different scenes. On the feature film, Peter Bogdanovich provides an introduction and there are two commentaries, one with director Steven Soderbergh and screenwriter Tony Gilroy, and the second with scholar Dana Polan. The former is an off-the-cuff appreciation of the film and its craftsmanship; the latter is an interesting analysis of its thematic concerns. Both are worth a listen. Lastly, there is an abridged reading of Greene's treatment, read by actor Richard Clarke. All in all, plenty for the interested viewer to dig into, covering just about every aspect of the film. Alas, none of the bonus material is presented in HD. Simply put, this is an excellent edition of a classic film. If you're a fan, you'll want to upgrade, and if you don't already have a copy, then you need to get one. I can�t say it much plainer than that. The Blu-ray version is occasionally striking, but overall the image quality is a bit disappointing.